Since any Neopoints you carry with you can be stolen by rabid Mutant Kadoaties or squandered away during a moment of weakness at Kauvara's Magic Shop, the National Neopian is here to keep those hard-earned Neopoints safe! You can deposit or withdraw whenever you wish! You can also earn interest on Neopoints you save, so saving is definitely a good thing. In order to upgrade to better account types, you need to deposit enough NP. The second column of the table shows how much NP you need to have in the bank in order to upgrade to the corresponding account type. You have to choose the new account type manually (see the bottom part of the screenshot) - it won't upgrade automatically, no matter how much NP you deposit. Keep in mind that once you get a better account type, it will never go down even if you withdraw some NP. 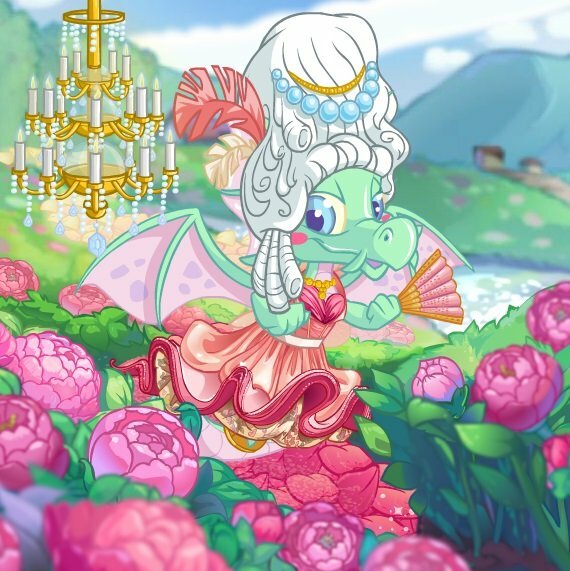 So, if you had 10,000,000 NP in the bank, upgraded to Ultimate Riches! and then withdrew some NP (or even all of it), you will still have 12.5% as your interest rate. To calculate how much NP you can get daily, just divide your yearly interest by 365 and round up. To get your daily interest, just click the "Collect Interest (*** NP)" button. Keep in mind that those NP will be added to your current balance, and you'll need to withdraw them manually if you want to spend them. Also, keep in mind that you should always collect your daily interest BEFORE you deposit or withdraw any NP - if you do otherwise, your daily interest button will disappear, and your daily interest will be wasted. One more thing you need to know about your daily interest is that you have to collect it manually every day. If you skip a day, the daily interest for that day will just disappear. That was made by TNT because one of their mottoes is "You must work by yourself for all your NP": if you could gain your interest automatically, you could just deposit some NP, leave for several months or even years and then return to see that you have much more NP than you earned before leaving. That's unfair from TNT's point of view. 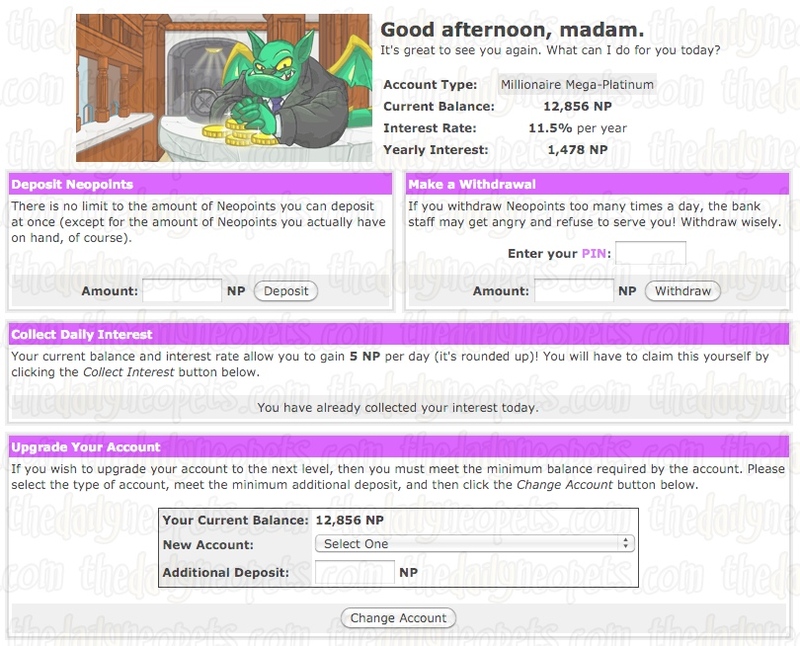 So try to visit your bank every day when you visit Neopets! You can deposit as many NP as you want (as long as you have that much), and you can do it as many times a day as you wish. When you withdraw NP, you can also withdraw as much as you want at a time (again, as long as you have that much in your bank account), but keep in mind that if you do it more than 15 times a day, you will get banned from withdrawing for that day. If that happens, just try again the next day. For extra protection, you can add a PIN to your bank account here . 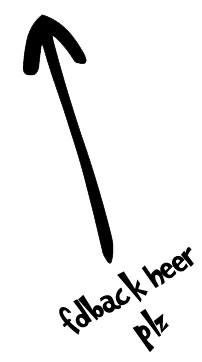 If you do that, you'll have to enter your PIN number before pressing the "Withdraw" button. It may seem inconvenient, especially if you withdraw several times a day, but it's actually worth it, because if a stranger ever gets to your account, he/she won't be able to take your NP from the bank and steal/spend them if they don't know your PIN number. Of course, you must understand that you should never tell your PIN number to anyone. You can prevent yourself from spending your NP if you're saving for something (by banning yourself from withdrawing on purpose - just withdraw 1 NP 15 times in a row every day, and you won't be able to take your NP from the bank and spend them on random things instead of the item of your dream, even if you're very impatient). If you want those tax trophies (the Tax Beast or Dr. Sloth), you most likely will never get them if you keep almost all your NP in the bank. The National Neopian Bank is a great thing everyone should use, because it helps you keep your NP safe and also earn more! So why not use it on a regular basis? The Snowager is awake. He'll be sleeping in 4 hours, 6 minutes.